As we wrap up the year, I want to take this opportunity to wish everyone in the National University System happy holidays. I also want to thank our team of more than 5,000 NUS faculty and staff who work tirelessly to bring quality education to more than 40,000 students. The dedication of our Board of Trustees, faculty, staff, students and alumni made 2017 a year of great achievements for National University, John F. Kennedy University, City University of Seattle, the Division of Pre-College Programs and the communities we serve. T. Denny Sanford with Chancellor Cunningham, NUS Presidents and members of the Board of Trustees. One of the instrumental ways we foster student success is through the collaboration of institutions and people across the System. Under the leadership of our university presidents, our schools, colleges and institutes have established themselves as pillars of excellence in the community. NU President Dr. David Andrews successfully launched the Precision Institute at National University, which takes an innovative approach to redefining teaching methods in higher learning to best meet the needs of our diverse student population. He also established the NU Scholars Program this year, which is a scholarship and educational program that recognizes students who demonstrate potential for high achievement and contribution to society. As president of JFKU, Ms. Debra Bean has realigned the University’s focus to support both student and community needs by expanding current program offerings in areas such as psychology and law. She also expanded academic pathways for NUS students and Bay Area residents through the newly established co-location of NU East Bay. CityU president Mr. Randy Frisch exemplifies the System’s core value of service to the community through education partnerships with organizations such as Alaska Airlines and Boeing. He also extended our global reach through maintaining successful relationships with international academic institutions such as the Banking Academy of Vietnam. Dr. Nancy Rohland, president of the Division of Pre-College Programs, which includes a virtual high school and charter schools is committed to delivering world-class resources to our K-12 students and, in partnership with the Hispanic Association of Colleges and Universities (HACU), she spearheaded a successful Youth Development Leadership Forum for hundreds of middle and high school students in STEM. All of our presidents are passionate about transforming education and it has been a pleasure collaborating with them to continue to strengthen and enrich our network of academic institutions. 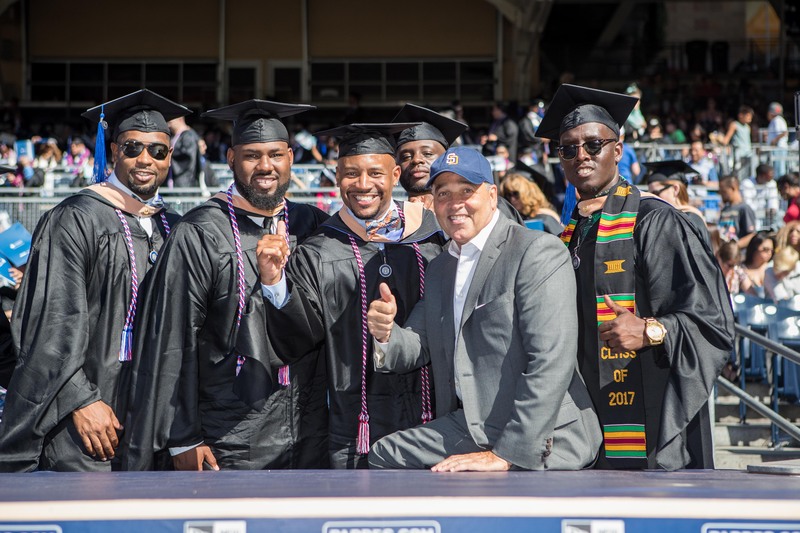 Veteran grads from NU’s School of Business & Management celebrate with Chancellor Cunningham at Petco Park. In the past, I’ve highlighted the record growth of our Sanford Education Programs, which were inspired by our friend and renowned philanthropist Mr. T Denny Sanford. 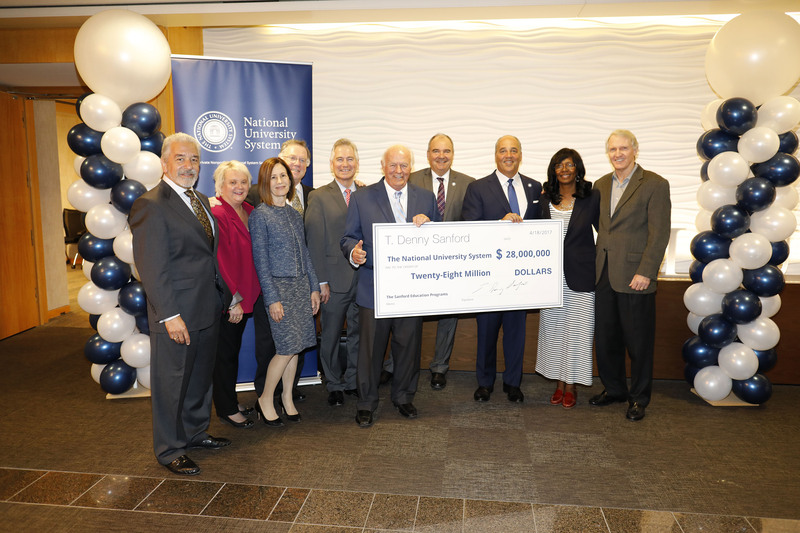 This year, the National University System received the largest donation in its history when Denny generously donated $28 million to our nonprofit university system. This contribution enables us to further our role in leading the national expansion of Sanford Harmony, Sanford Inspire and the Sanford Institute of Philanthropy. Through the System’s expansion of these programs, we remain true to our values, which is building a better tomorrow through education. We marked a significant milestone this year in carrying out our System goals, as we celebrated the launch of National University’s newest campus location, NU East Bay in Pleasant Hill. Through a co-location arrangement, NU and JFKU are expanding academic offerings in the San Francisco East Bay region – creating new opportunities for students in programs ranging from bachelor’s and master’s degrees in specialties such as nursing and criminal justice administration to law degrees and a doctorate in psychology. In addition to NU East Bay, another notable expansion of academic pathways comes from the NU partnership with CityU to offer a Doctor of Education Leadership degree. These achievements are just a small sampling of our successes and remind us of what we can accomplish together. 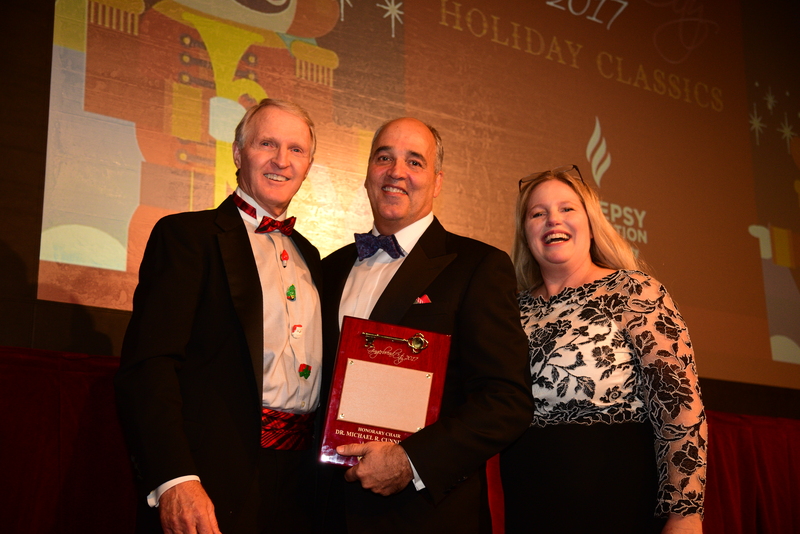 Chancellor Cunningham with NUS Board Member, Dr. Lee Rice and Ms. Kathy West raises support and awareness for the Epilepsy Foundation of San Diego County at the 24th Annual Gingerbread Gala. Throughout the year, we experienced additional benefits from collaborating across the System through the Innovation Grant Program. This program provided resources to enable our faculty and staff to develop and explore in areas aligned with the System’s history and future. Programs such as: National University’s ACCELERATE Innovation Program for Veteran Students and Standardized Patient Simulation for Nursing Education, CityU’s Math and Statics Lab, and JFKU’s Volunteer Opportunities Immersion Corps (VOIC) demonstrate the continued commitment of the National University System to advancing academic excellence, student success, educational technology and connecting with the community. Again, I’d like to thank our Board of Trustees, faculty and staff for their dedication to providing our students an exceptional experience. I also want to thank our students for their diligence and commitment to lifelong learning. Each of you contributed to our successes, and for that you have my sincerest appreciation. I wish everyone a safe and happy holiday season, and I look forward to working together to make 2018 another year of academic excellence, innovation and serving the public good!